Gear Up's customer rewards program is simply, easy, and best of all Rewarding! Here's the skinny on our program. For every $10 you spend here at Gear Up you earn $1 in rewards credit. No restrictions on products. No minimum amount to hit before the rewards kick in. No maximum to the rewards. Rewards are valid for 365 days from your purchase date. 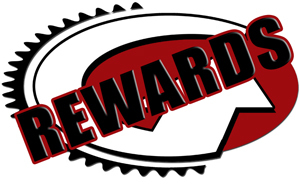 Reward dollars can be redeemed for any products, anytime. You do not have to sign up or perform any special tasks to be enrolled, when you complete a purchase the reward credits are automatically added to your account to use on any future purchase. To access your rewards balance you'll need to sign in to your account. Once in your account navigate to "Rewards" to view your current balance. When you're ready to convert your rewards to store credit you simply choose "Redeem Rewards" from your account and the system will generate a coupon code for you to enter during the checkout process which will apply your rewards credit against the total value of all the items in your cart. *Please note it will not work with shipping charges. **Any remaining balance will remain as available credit on your rewards code and you can view your balance at anytime in your account details.